Producing medical marijuana in Canada is heavily regulated and carefully controlled by Health Canada, this control is not intended to be an invasion into the integrity of the medical marijuana producers. Although Health Canada is concerned and active in making sure that there is as little risk as possible for this legal marijuana escaping into the private non regulated drug market there are many other aspects of its work that are just as important and do not involve the marijuana harvest being stolen. When the well-sealed jars are ready they need to be stored in a cool dark place. Health Canada agrees that fridges are ideally suitable for marijuana storage but it is essential for your storage staff to be very attentive to any build-up of mold caused by the marijuana being cleaned but not dried carefully. 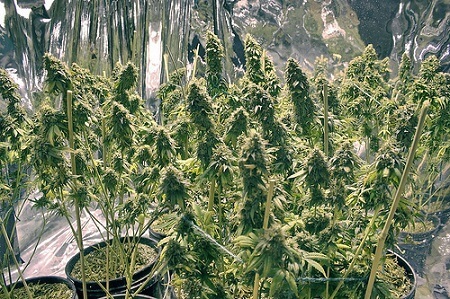 The buds will actually continue to grow when in storage and make the marijuana smell better and increase the sales value of the crop. When is the best time to harvest your medical marijuana crop? As medical marijuana can be grown at all times of the year there is no precise week or month when it should be harvested. However despite this vagueness there are good rules that apply to tell you when your crop is ready to be harvested, what you need to do is keep a careful eye on the trichomes as they are essential to the value of your crop. You need to carefully check the trichomes and ensure that they are just ready for harvesting, if you act too soon they will not be mature enough to be harvested when they are in peak condition. If you leave your harvest too late the trichomes that are very fragile could fall off, even with gentle handling, and reduce the potency of the harvest that you deliver to the market. If you decide to store cannabis you need to keep it in clear plastic bags, this is the best form of storage but you need to take great care as the plastic bags always have some static that is attractive to the resin glands that you are trying to protect and keep intact. So the good advice is to use plastic storage bags are great for samples to be shown to customers but you should use large rigid containers to store your production marijuana and keep it in tip top condition. This is probably the worst move you can make because the precious little trichomes buds become frozen stumps. Freezing trichomes buds therefore become brittle and are at high risk of breaking off taking their vital resin with them. Each time one falls off the potency of the marijuana is gradually reduced and so offers less active ingredients that could help your patient to alleviate the symptoms that your drug is intended to address.